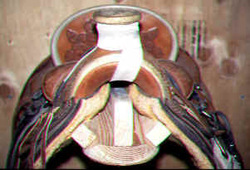 Do you have a problem with your saddle rolling or tipping off its saddle stand? If so, you may like this solution used by the late George Havens formerly of Sun City, Arizona. George was the Trail Boss, in charge of trail maintenance, in Rocky Mountain National Park for a number of years. He was also in charge of the horse barn for the National Park rangers. In his pre-park service days, George ran his own livery out of Estes Park, Colorado. Always partial to a neat and orderly barn, George liked to add built up pieces of wood to the front of the saddle stands, so the saddles stay put. The basic wooden saddle stands can be made either of 2" x 6" boards as in this free standing stand. Or they can be made of shaped 2"x8" boards like the wall mounted stand below. 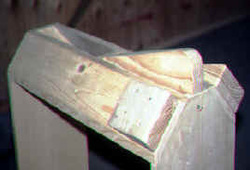 Then George added tapered and rounded wooden pieces, one on each side under the front of the bars simulating the shoulders of a horse, and one in the center to steady the gullet of the saddle. The pieces are attached with screws. The heads of the screws are recessed so they won't catch on the lining of the saddle. There the saddle stays, always in its place.